I'm guessing you're here because you're ready to 'tech' on this school year. 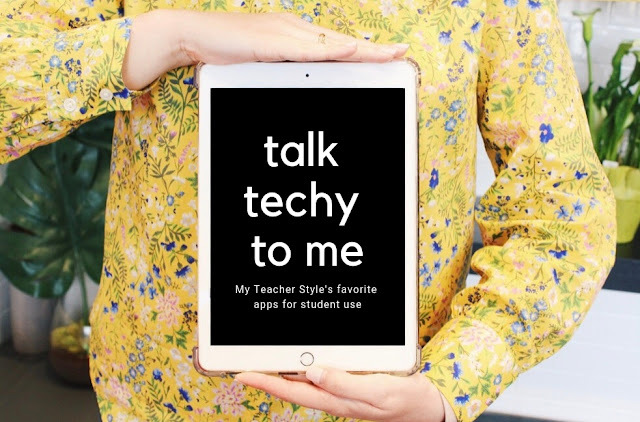 😉 Before I start sharing my top favorite technology tools, let's talk about the why of using technology in the classroom. Incorporating the use of technology in meaningful ways in the classroom gives us the opportunity to engage our learners in new ways, allows us to teach about (and model!) Digital Citizenship, and helps us prepare our students for their future. Because my focus with my students is on using technology as a tool not as a toy, I'm very specific with the language I use when we approach technology use. One of the biggest things is the choice to say "platform" instead of "app." Many kids think of games when they hear app, so I start reframing that thinking by calling all of these wonderful tools "learning platforms." Something else to keep in mind when reading this post is that my school is 1 to 1 with devices for 5th Grade, so each of my students have an iPad to use daily. They are only able to use their device at school. One of my goals for my students (and myself) is that we are using our tools to produce more than we consume. There are times to use these tools to consume information, and a lot of important lessons can happen around that... but I mostly like to have my students creating and showing their learning with these engaging platforms as much as possible. There are so many learning platforms that I love to use with my students, but today I'm sharing my top 9 that I use most often and have found to be successful K-5. Under each of these 9 platform icons you will find a brief description of the tool, the devices this platform is available for (I did my best to vet these out for you), some of the reasons why I love it, and then usage ideas (from things I've done, to things I've seen other teachers in my building try, to random ideas I have). If there is ANY other information you'd like, please shoot me and e-mail or respond in the comments below. Without any further ado... let's take a peek at some of my favorite learning platforms & tech tools! Why I love it: Seesaw is the digital portfolio that houses all of my students' projects from outside apps/platforms. 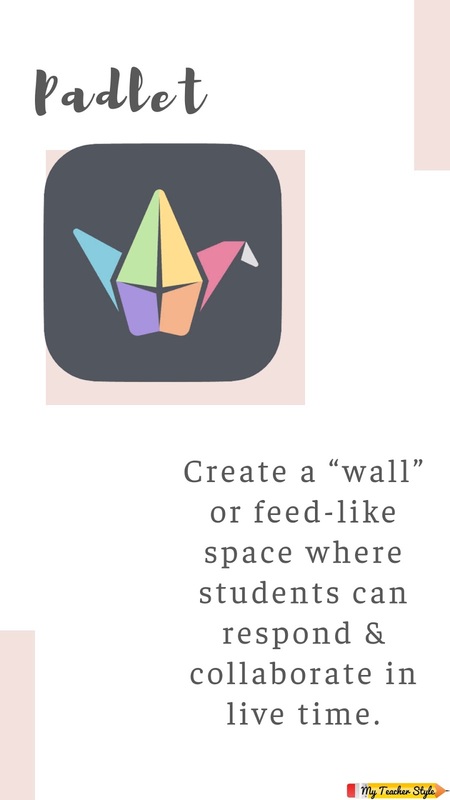 My students respond to the specific assignments I set up with projects they create within the app or on another platform, then students can comment in a variety of ways. I'm able to comment back to them and there's an option for parents to see what students are up to. There are just so many reasons I love it, and I think you'll see a few more below. 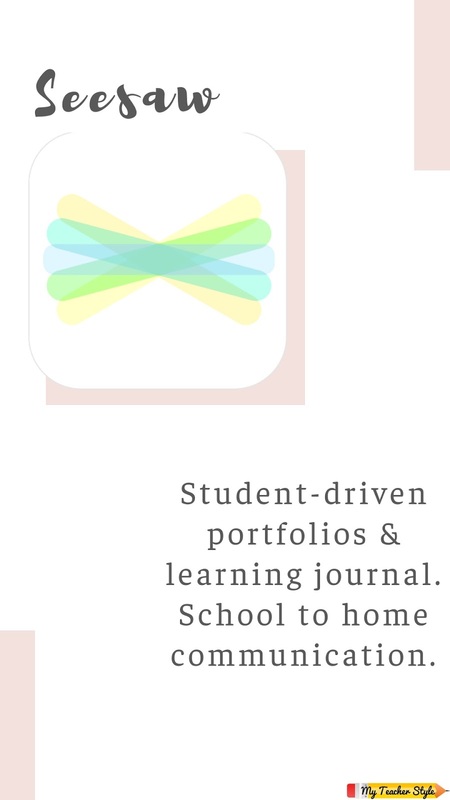 - Student-Led Conferences Portfolio -- Students can showcase their favorite assignments to their families in person or through the "Seesaw Family" app. - Grading Hub -- I respond to my students assignments with comments about things they did well, possible areas for growth, and their overall grade. This keeps communication open, allows students to know exactly why they're receiving the scores they have, and keeps me organized too. Why I love it: You can see all of your students' iPad screens at once, mute student iPads, lock student iPads, view specific student's screens... need I say more?? - Manage Student Use -- You can use the view feature to see if students are on task and using their device appropriately. There have been 2 times in the years where we've been 1 to 1 where I've had a student doing Google image searches that were off task. I was able to click on their screen view, screenshot, and lock them out of iPad use. Then I was able to revisit Digital Citizenship and the use of these tools with that specific student without their peers noticing. - Gather Students' Full Attention -- The most powerful, silent attention-getter is locking everyone's screen at once! 🙌 I've taught students that if their screen is ever locked their job is to find me right away. When they notice everyone has been locked at once their heads whip up, the room gets silent, and nobody can do anything but give me their undivided attention! Why I love it: This platform is a quick (and easy) way to receive student responses. Student's don't see each others responses unless you choose to project in front of the whole class. You can choose if responses are anonymous or if they require a name. Results can be e-mailed or turned into a spreadsheet, which makes for a great formative assessment tool. 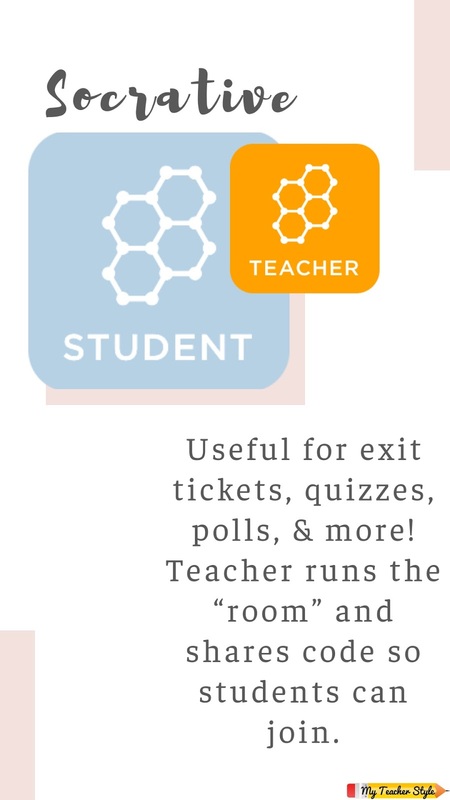 - Exit Ticket -- Pose a short answer question and give students time to respond. Project and debrief responses for the class to see if you'd like or keep the results for yourself. - Poll the Class -- After students submit their responses you can give them the opportunity to vote on the responses that they most agree with. I've also used this when preparing for Socratic Seminars. Students write their most burning questions and then vote on which ones they'd like to discuss. Why I love it: This platform showcases student responses all at once in live time in a beautiful and clean feed-like wall. There are many options for setting up the design and endless opportunities for how to use it! - Create a Twitter-Like Experience -- Have students "tweet" out like they are characters from a novel, give a short response to a question, condense the steps to solve a math problem, etc. They can create their "username" and put it up in the title and then streamline their thoughts to a to 240 character "tweet". - Replace Poster Paper with Padlet -- Save some $$ and supplies by creating multiple Padlets (and QR codes). Replace an activity where you would have had students walking around the room writing their thinking on poster chart paper, and instead have them post responses to Padlets. - Turn on the Reaction Feature -- Give students the opportunity to respond and interact with each other's thinking by reacting to their peers responses. Options include a star rating system, scoring, voting, liking, and commenting. 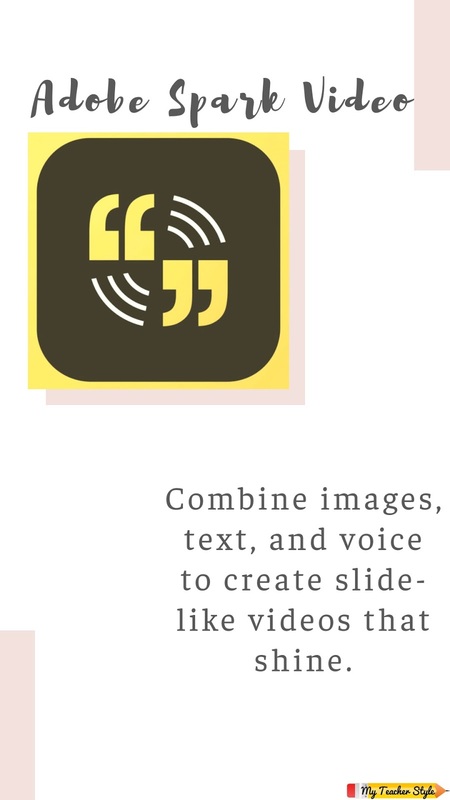 - Engage with Visual Representation -- Students can post images as well as text in their responses. Working with littles? Have them share images instead of typing out responses! Working with older students on symbols, mood, themes, etc? Have them share images! It's just a different way to check in. 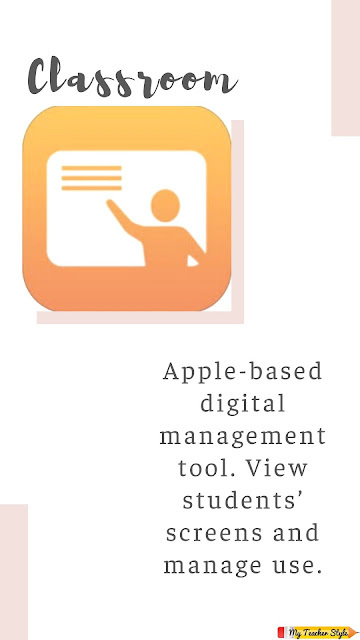 Why I love it: When wanting students to shift from being consumers to producers, this is a simple app to choose! It's so user-friendly and easy to learn. Student responses can only be 30 seconds or less, so kids have to streamline and condense their thinking. It's fun when used with littles, adult learners and anything between! - Summarize the Text or Steps -- Students can take a selfie, edit it with fun stickers, and share the steps to solve a math problem or summarize the story. - Be the Book Character -- Students can take on the persona of one of the characters in the text and respond to a question or show their understanding of the target skill for the week. My kids always love to do funny voices when we respond this way... whether they're a kid from Wayside School, a Tree Kangaroo from Papa New Guinea, or Double Dutch Champion, they love showing their learning while becoming another person. - Share the Letter or Number of the Week -- For younger grades, students could take a picture of the letter or number of the week and talk about their learning. 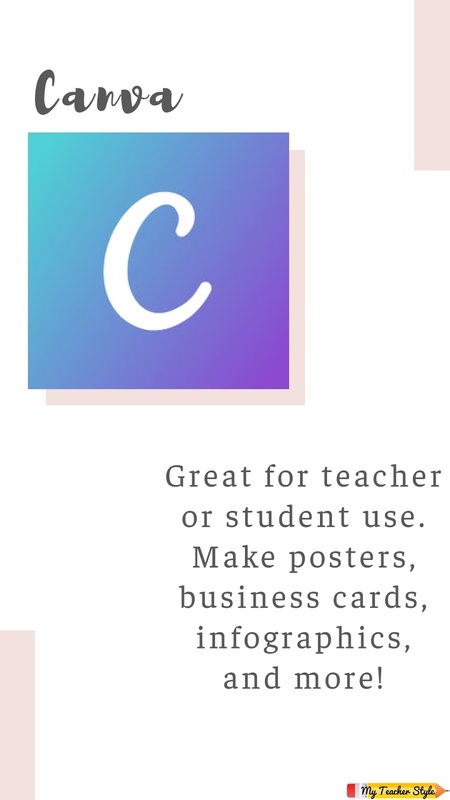 Why I love it: Canva helps you (or your students) create the most beautiful posters, social media posts, or infographics. You can take an existing template or start from scratch. Everything saves in live time as you work on it and edit. The only downside is that sometimes work doesn't save fast enough. - Student Created Posters -- There are so many different directions to take this. I've had students use this platform to create "propaganda posters" for our Revolutionary War unit, show their understanding of sequence of events, create advertisements for school events, and so much more! 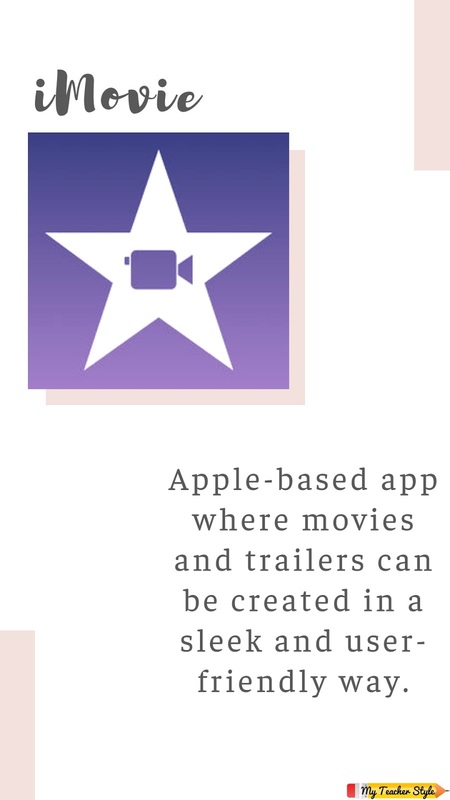 - Dabble in App Smashing -- Students can take the projects they create in Canva and "App Smash" by inserting them into an iMovie or other platform. Why I love it: This is another user-friendly platform that gives students a lot of pride and ownership of their work as they become "authors." The book can be saved in your iPad book library, played like a slideshow, or even be printed! - Class Book -- Collaborate with your students to create one cohesive work. Each student could work on one page for a class alphabet book, "yearbook", or showcase of learning throughout the year. - Personalized Yearbooks or Reflective Portfolios -- Throughout the year, students could work on creating their own archive of pictures of memories, favorite projects, and reflections throughout the year. It's theirs to keep and reminisce on when the year is through. 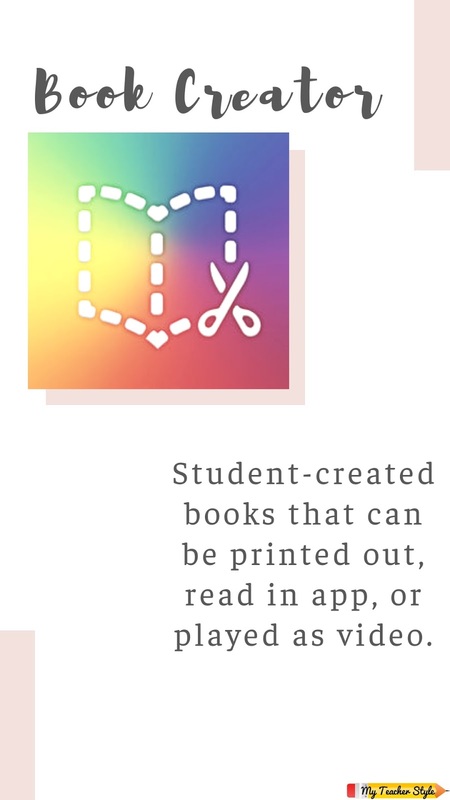 - Unit Books -- Students could create their own book as a record of their learning throughout a particular unit. On your rubric or "must-have" list each page could have a specific focus of what students need to show. - Student Showcase of Research -- Student's could conduct research, formulate their thinking, and compile their learning to share with the class. A fun alternative to a typical essay format. - News Updates -- Using the movie side of the platform, students can make News Updates sharing major breaking info on how to solve specific types of math problems, report on current events (from stories or actual current events), and more! This is especially fun to do in small groups. - Leave it Open Ended -- This might sound scary... but I love letting students decide how they want to use this tool because these creative kiddos surpass my expectations every stinking time. I will post content "must-haves" and then let students decide how they want to share their learning and understanding of specific concepts. - Simple Summary -- The first time we use this platform, it's for our story summaries. Students write their summaries on paper in 8 different boxes, and then transfer that work onto 8 different slides. This platform focuses mostly on voice, so students typically type in key words or use icons/pictures to catch viewers eye and enhance their retelling of the story. - Create a Commercial -- Students have used this platform to create commercial-like projects to display their work. 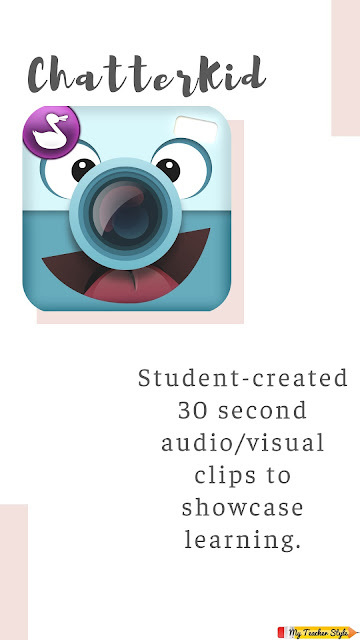 - Make a Video as a Class -- Each student could be responsible for their own slide. A Kindergarten teacher at my school worked on creating a collaborative video with her class where each student helped develop part of the plot and moved the story along with their own illustrations and voice overs. Too cute! I hope you found a few new platforms/apps in this post or came away with a fresh idea on how to use a platform you're already loving. Have any questions about these platforms? Want to see more tech-related content? Tried one of these ideas in your class? Please let me know in the comments below! I can't wait to see how you 'tech' on your school year! 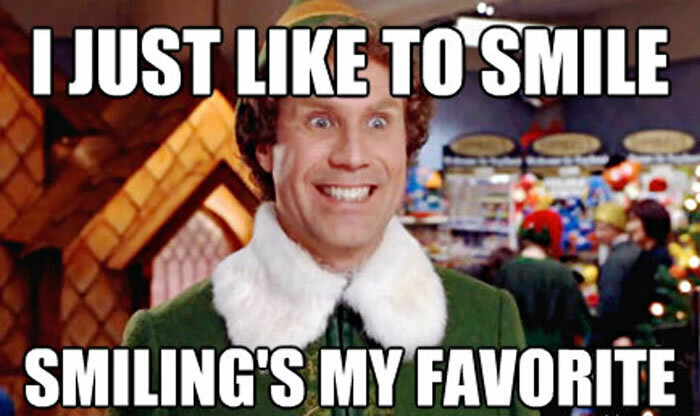 If you're like me (and Buddy the Elf), you just like to smile! I love to start each day at work with a warm greeting to my students which includes a big toothy grin. I don't know about you, but with all of the coffee I drink I sometimes get self-concious wondering if my smile looks dingy. 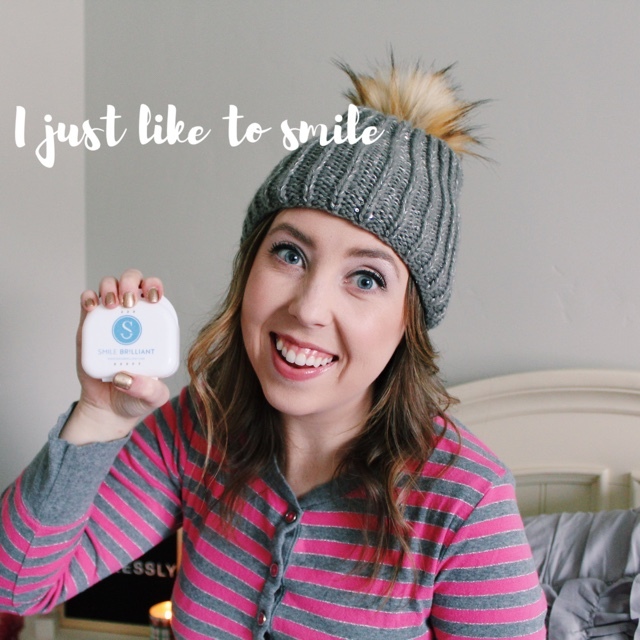 I'm smilingly more confidently these days though thanks to Smile Brilliant, and I'm so excited to share some opportunities with you so that you can too! I've tried all sorts of whitening products (from strips to toothpastes) to get that bright glowing smile just in time for the first day of school or Parent-Teacher Conferences. Each smile is unique though, so I'm thankful for a product that fits me and my teeth perfectly, providing the opportunity to get my "pearly whites" looking pearly and white again. I'm excited to share my results, tips and a GIVEAWAY opportunity with you! The first part of my whitening process was taking my impressions. I loved this because it gave me the opportunity to have professional whitening molds that perfectly fit MY unique smile. After my whitening kit came in the mail, I could tell just how user-friendly this product is. It was nice to unwind from a busy day at work and be able to whiten my teeth from the comfort of my own home. I would use the "whitening gel" first from anywhere between 45 minutes to 2.5 hours. It was just so easy because my teeth could be whitening while I was grading papers or working on lesson plans when I got home in the evenings. After the whitening gel, I would use the "desensitizing gel" which only took 15-20 minutes. As soon as my whitening process was over I would go to bed and let the leftover gel sink in as I caught some Zzzz's. The more I used the product, the more compliments I received from family, friends, and even students on my bright smile! My whitening kit soon became a tool just as powerful as the other supplies in my pencil pouch. For your chance to win your very own $149 credit (which you could use to purchase your own Smile Brilliant kit!) check out THIS LINK! Or you can use my code [myteacherstyle15] for 15% off any purchase!! Hello Gourd-geous! You and I both know that October is crazy and busy and random and fun and full of sugar. Personally, October is one of my favorite months of the year. Fall candles, layered outfits, changing foliage -- I love it all! Professionally, October is one of the most stressful months of the year. I've read many articles talking about how October is "the month of teacher burn-out." I don't care how long you've been teaching, October seems to leave every teacher I know feeling a little frantic and frazzled. The Halloween season is upon us, conferences are looming overhead, the "honeymoon" period is over, meetings and extra events are piling up... BUT you can do it. I'm sharing a few tricks with you today so that you can focus on teaching and enjoying this month with your students! Trick #1 - Take a breath. Take time this month to do something that gives you oxygen in your personal life. Pausing on all of the crazy will help you to find your center and re-energize for all of those things vying for your attention. Trick #2 - Be mindful of what you put in your body. 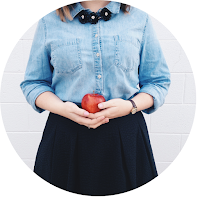 I'm not your doctor, so I'm not going to tell you what you can/can't eat... but I am going to share a little bit of what I've learned about my own body lately. I WANT ALL OF THE SUGAR. Especially when I'm stressed. Everywhere I turn in October I can find some sort of sweet treat that I could justify deserving because I work so darn hard. Sometimes I do give in to the temptation and at least take a bite. But I've noticed just how much sugar and carbs really cloud my thinking and make me tired/lethargic. I don't know if your body works anything like mine does, but I know that I need to be fueling it with healthy foods this time of year so that I don't get sick and I can be on top of my game mentally. Trick #3 - Mix in some seasonal activities. You don't have to spend money or do too much work to increase engagement in your classroom. There are lots of neat seasonal lesson plans and activities on the internet that you could utilize, or you could take a lesson you have already planned and put a little seasonal spin on it. For example, we're teaching long division right now in 5th Grade. To increase engagement, our team is having students create their own Halloween/Harvest themed division word problems embedding our recently learned vocabulary. This has made a pretty dull topic come to life as students are crafting sentences utilizing words like "partition" and "iterate" and then sprinkling it with footballs, and candy corn, and pumpkin pie! Using the change in seasons to your advantage can be a great (and easy) way to engage the learners in your room. Trick #4 - Give your students (and yourself) a break. Set an achievable management goal with your students. (Examples- Quiet on the way to/from the lunch room all week, Received compliments from all Specials teachers for good behavior, Cleaned up the room each day in less than 4 minutes, etc.) When students reach that goal to your standard for a certain amount of days, reward them! In my room I have a marble jar. Students work together as a whole class to earn marbles for positive behaviors they display as a unit. When they fill the jar up, they earn a reward of their choosing. We start this on the first day of school and my students typically earn their first "marble party" in October each year. I let them decide what they want their reward to be... a popular choice is a movie party. This gives them a break to be social and relax and it gives me a break to work on grades or my other to-do's. The most important thing about this break is that it is EARNED. My students are watching a movie for part of the day, but they can articulate exactly why and what they can do to earn it again. Trick #5 - Go with the dance. Sometimes you just can't fight the crazy that is October. Roll with the punches as much as you can. When unexpected things pop up or go wrong, your reaction matters. Sometimes our reaction to stressful things is they only time our students get to see an adult respond positively to the negative situations life throws their way. (Thanks Rushton Hurley!) Go with the dance of life and try to take the time to make those things teachable moments. Trick #6 - Remember you're not alone. I have seen even the most masterful educators frazzled in the midst of peak "burn-out season." Reach out to someone when you're feeling stressed. Maybe you need to talk with a friend you trust in your school, a teacher you've connected with over social media, or perhaps someone who is completely outside of the education realm. Find someone who can understand how real the struggle is, allow you to vent, and then help you get over it. Okay, Teacher friend I hope that trying out some of these Tricks helps you to enjoy the time you have to Teach the ghouls and boys in your class. 😉 You've got this! I like to move it, move it! 💃 And I know that my students do too! There are so many studies out there about how music boosts brain chemicals and activity. I think that music in the classroom can be a great motivator! It can help learning "stick", enrich our classroom community, and ENGAGE my students. I always like to have the perfect playlist to set the mood for the day/lesson and today I'm sharing my 8 favorite playlists I've made with you. **These playlists all contain clean songs that I have deemed "school appropriate." My standard is no profanity and very limited/no suggestive content. If you noticed that there is something on one of these playlists that you are concerned about, please let me know! This playlist reflect's my students and their unique personalities 100%!! 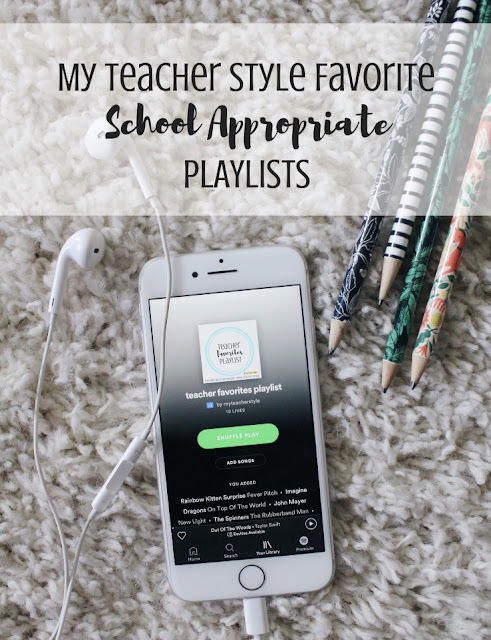 For more information on how my students and I compile our class playlist each year check out this blog post. I play these student-selected songs on shuffle during movement breaks, transition times, or work time where I'm okay with things getting more noisy. It's always fun to guess which song "belongs" to each student. This playlist is my favorite for community building. There are those times before or after school when I'm hustling to get work done and I just like to JAM. This is the playlist I listen to. This playlist was created for teachers by teachers (thanks Insta/FB friends who helped me out)! There are times when I'm getting things ready when I have students/coworkers/parents come in unexpectedly. Because of that, I a made sure that this playlist is clean so that I can stay professional even when jamming out. This is probably my most played playlist! My students and I affectionately refer to this playlist as our "Brain Jams." I created this totally instrumental playlist with many different genres in mind. From classical, to pop covers, to movie scores this instrumental playlist has it all. Some days I hit shuffle to get a fun, random mix. Other days I'll scroll to a specific section to play similar styles of songs. Brain Jams flow during small group discussion time, individual work time, and assessments to fill the space and set the mood/tone for the lesson. This playlist always makes me want to stand up and dance! I use this for our movement/dance breaks, welcome music, work time, and for my own getting-ready-for-the-day-pump-up-playlist. It always surprises me how many of these songs my students know and sing along to. P.S. This is the playlist I've used for any staff meetings/PD I've helped facilitate. Once again, it's about setting the tone that I want and I've found that these songs always bring a smile to people's faces. Need the perfect playlist for your class Halloween party or to set the spooky mood this October? I've got you covered! I've compiled some of my favorite, kid friendly, ghoulishly good songs that your whole class is sure to enjoy. I get so excited about Christmas after Halloween that I sometimes forget to listen to all of the good Thanksgiving Jams out there! Okay, so there aren't tooo many Thanksgiving songs... but I've put together an hour long playlist that is perfect for your class feast or any other festive activities you have planned. I especially love to play "I've Got Plenty to be Thankful For" from Holiday Inn each year as we start our Attitude of Gratitude activity. 'Tis the season to be jolly! If your school is as into celebrating Christmas and Winter as my school is -- this playlist is sure to be a hit. Full of fun renditions of well known songs, this 7.5 hour playlist (what can I say, I really love Christmas) is fun to shuffle through all season long! Valentine's Day (or PALentine's day as I call it in my class) is my student's last class party of Elementary School so it's a pretty big deal. We focus on the love of family and friendship and of course I had to look for some upbeat tunes to match the occasion. Join the dance party on Spotify -- my account is MyTeacherStyle. 💃 Let me know in the comments below if there are any other songs you want to see on these playlists. Have fun moving and grooving! Happy beginning of the year! I hope that things are off to a great start in your classroom. 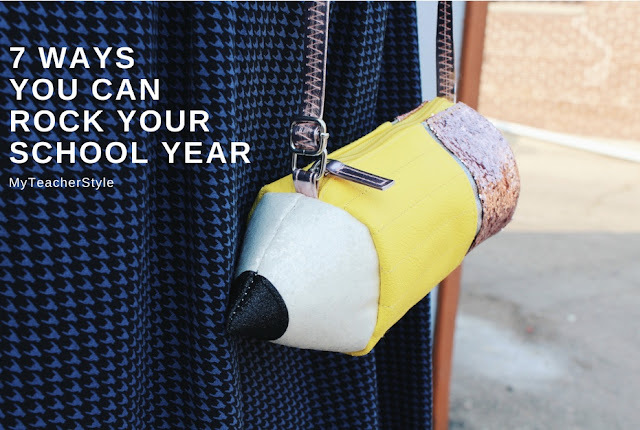 Today I'm sharing 7 ways you can rock your school year. These are things I believe any teacher can implement -- whether you've been teaching 5 years or 5 minutes! Confidence is one of the best things you can wear. It doesn't matter how long you've been teaching, the way you carry yourself is important. I find that doing a little "posture check" at times when I'm feeling frazzled and frantic is especially important. Taking the time to realign myself (inwardly & outwardly) while taking a few deep breaths helps me to exude the positive confident self that I am, and not the little stress ball I feel like sometimes. Also, don't feel like you have to apologize or make excuses for yourself. We are all always learning. Treat yourself and others with respect and you'll be on your way to rocking your year. 2. Make the most of your mornings. I hate feeling rushed in the morning! I've found that the way I start my day usually sets the tone for the day. I love sleeping in, but making the most of my time in the mornings seems to get things going in a better direction. I like to wake up with plenty of time for me to get ready, make my bed, eat breakfast, and have my devotions before I leave for work. Maybe making the most of your mornings includes time for you to workout, watch the news, or go over your lesson plans again. Whatever it is that you need to do to feel ready for the day, backwards plan your time so that you can be present in these important tasks as you set your intentions for the day. Confidence in one's demeanor is definitely an important way to make a good impression. What you wear is one facet of having that confident presentation. One of my first rules for dressing to impress is find cute outfits that make you feel good. This goes back to confidence, you want to know that you are rocking what you're wearing so you can be ready rock your school year. In addition to wearing cute outfits, choose pieces that flatter your figure and are ironed! Don't show up for work looking sloppy. You might think people won't notice, they will. Take the extra time to put the extra effort into your look. You are worth it! I make the most of each transition time. I start off every day (and every new class period) by greeting incoming students with a handshake. I start this routine on the first day of school. Teaching youngsters how to give a proper handshake sets the tone for your expectations of them as learners as well. I don't welcome students into my class until they've shaken my hand, looked me in the eyes, and responded to my greeting in an appropriate way. Starting the day off with a handshake and a smile shows my students I mean business, but I'm warm too as I greet them with saying their name, a compliment, or another greeting. 5. End your day in the right way, too. At the very end of each day I say good-bye to my 5th Graders in a variety of ways. I tell them from the first day that they can say farewell by giving me a handshake, hug, or high-five. It's totally up to each student every day! Some students do a signature exit strategy, while others mix it up each day, and some even create special handshakes with me. No matter what, it's a perfect book end to the day as I personally remind each and every student how much I care about them. 6. Find a good "thinking partner." We don't have to do this job alone. 🙌🙌🙌 I believe that we are better when we work together. Maybe your thinking partner is someone on your team, perhaps someone down the hall, or a connection you've made on Social Media. No matter who it is, it's important to have someone to collaborate and brainstorm with. This person should be someone you feel totally comfortable being yourself around. Sometimes you have to reflect on your successes and failures out loud to really let them sink in and process how to get better results next time. Your thinking partner should be someone you can talk to about these things and you can trust their advice without any fear of judgement. "Every day is a fresh start." "Mistakes are proof you're trying." These are things we say to our students as we encourage growth mindset within them, right? It's time we say these things to ourselves. If there is something you're doing that is taking a lot of time/effort, I would encourage you to reflect and reevaluate. Is there anything in your class that you're doing that a student could do? Not everything has to be totally perfect, find ways you can give jobs to students, streamline your workload, or just cut out things that aren't necessary. It will be a better use of your precious time and energy! I hope these tips empower you to feel like you can rock this school year! Are you already doing some of these things? Any suggestions for others on how they could rock their school year? Sound off in the comments below! It's time for a Q&A sesh! Step into my office. Although I'm just sitting at a local coffee shop with my MacBook responding to all of your questions, in my mind you're sitting across the table from me with a latte in hand as we chat about all things teaching & fashion. I had too much fun watching your questions roll in on the fun new feature Instagram rolled out this last week. Thank you for your patience in waiting for my responses. 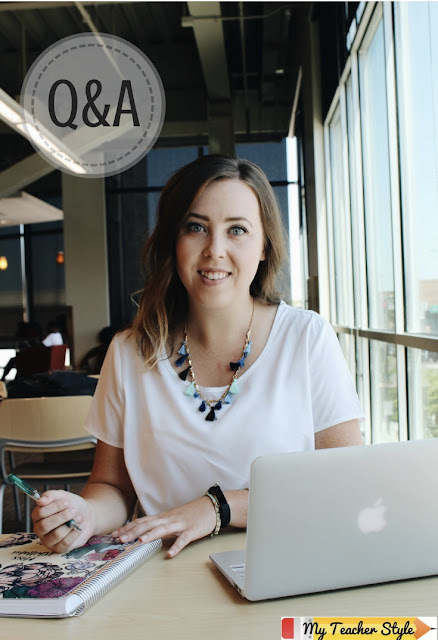 I felt like these questions deserved deliberate answers with some explanation, so I thought this would be the best format to talk about it with you (although I would really prefer you were at this coffee shop with me 😊). Side Note: A few questions were duplicates or really similar so I combined questions to try to keep things more concise. Q: What is one thing that you wish you better prepared for the first day of school? Q: What tips do you have for a first year teacher?? A: I heart new teachers! I have 4 main tips for a first year teacher -- but if we're being honest any teacher can take these tips as a good reminder. 1. Believe that you've got this!! I believe in you. You are (most likely) fresh out of college which means that you are up-to-date on what best practice is and have lots of ideas and strategies that you're excited to use. Capitalize on that! 2. Reach out if you need it. Whether you feel more comfortable reaching out to a teammate, someone down the hall, or a teacher blogger/Instagrammer it doesn't matter... we are better when we work together! I've found I'm most successful when I have a few different "thinking partners" I can reach out to when I have a question about parent communication, wanting some ideas of how to help a particular student, or just needing some fresh inspiration/place to vent. Build your teacher tribe with the people you want to have the power to speak into your life and utilize them. 3. Take time for you! You can't pour out of an empty cup. Those papers will still be there for you to grade tomorrow. Find the balance between personal and professional life. This looks different for each and every person, but no matter your personality or availability Self Care is a must! 4. Reflect! You might feel like you're running from thing to thing, but take time to reflect -- you'll thank yourself later! In my Teacher Planner I will try to write quick little notes at the end of the day, after a lesson, or even the next morning while I'm getting ready, reflecting about what I want to repeat or what I want to tweak for a lesson. My notes are always very short and simple, but every year as I've sat down to plan, looking back at those little notes from the year prior has been helpful to spark my memory. Reflection is truly the best way to fine tune your practice. Don't repeat your mistakes -- learn from them. Don't forget your successes -- celebrate & reflect on them! Reflection = GROWTH! Q: Where is your favorite place to get affordable and fashionable professional clothing? Q: Tips for beginning of the year reading instruction? - I start with sharing with my students my personal views of reading along with some "testimonials" from former students. I've always loved reading because it can take us places and give us a "mini-vacation", best friend, and lessons to last a life-time. I share these thoughts with them. I know that not all students share my sentiments so I let them know that I've had students who didn't like reading and struggled, but how they grew to "liking" it and finding books they enjoyed. To add a touch of humor, I remind them that reading is one of those skills that are essential to success in life -- if they plan on going to a restaurant, they'll need to read the menu... if they plan on driving some day, they'll need to read road signs and directions... you know, the important things! - I divide students into small groups and give them an article about reading. Each group gets a different article and they know that their ultimate goal will be to become an "expert" about their article so they can share out with the class. I love doing this because it sets the tone right at the beginning of the year for collaboration and discussion of texts, along with ownership of learning. Each article I give students is focused on the benefits of daily reading and each one focuses on different reasons why. When students finish reading in small groups and becoming "experts", I shuffle up groups and have students share their learning with students who read different statistics. At the end of the reading session, we have a whole class discussion where students share the benefits of reading that they learned about. This creates "buy in" for reading instruction and I refer back to this day and these statistics throughout the rest of the year. - Before diving into our curriculum, I do an adaptation of this Close Reading Oreos activity. This also gives me the opportunity to start to set up the framework for Reciprocal Reading as we practice "previewing" our Oreos, "questioning" what could be in them, "clarifying" our observations, and "summarizing" the experience. Plus it is SO MUCH FUN!!! 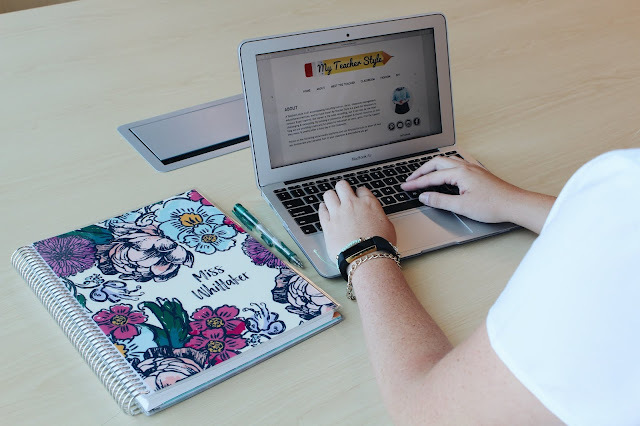 - As we shift from the first few days of school with these intro lessons, I always have my students do a fun scavenger hunt through the curriculum textbook so that they can see the types of things they'll get to read about in the upcoming year. The graphics are great and I always hear lot's of "ooohs" and "aaahs" as students flip through the materials. These activities help get the beginning of the year started in a positive way as students get to practice being curious, engaged in their learning, and collaborative before we begin more rigorous reading. Q: What are some of your favorite apps/tech tools to use with your students? - SeeSaw- It's an awesome digital portfolio that allows students to submit work and reflect. It also provides space for that student and I to be in communication about their progress and gives them the opportunity to resubmit. - Adobe Spark Video- This tech tool creates smooth, professional looking videos. I love how easy it is for kids to learn how to use and navigate. Students have used it for book summary projects, synthesizing information from multiple sources, and sight word practice in younger grades. - Canva- This one was trickier for my 5th Graders to navigate at first, but with multiple exposures they became so comfortable they were teaching others! This platform creates beautiful posters and infographics. I used it with my students last year to create Revolutionary War Propaganda Posters that you might have seen on Instagram. - iMovie- Another movie app, but this one has some unique features. Students have used it to create trailers for different books we've read, "newscasts" sharing their learning, and YouTube worthy math tutorials. Q: What planner do you use to keep track of your professional/personal life? For personal planning I use the calendar in my iPhone and sync it to my Apple Watch to get reminders about upcoming appointments and events. Thanks for joining me for coffee today! Please don't hesitate to drop some follow-up questions in the comments below! Copyright - My Teacher Style - JJW - 2015. Simple theme. Theme images by Ollustrator. Powered by Blogger.